Australian conservationist and television personality Steve Irwin, a.k.a. 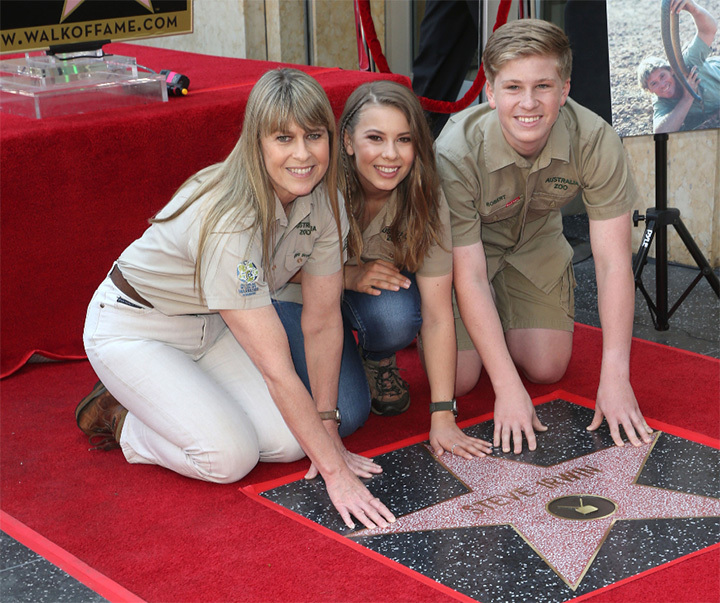 the "Crocodile Hunter", has been awarded a star on the Hollywood Walk of Fame. Steve Irwin's 14-year-old son, Robert, discussed the event with Jimmy Fallon on The Tonight Show this week. ""It was such an amazing honor," Robert said. "He's really one of the only conservationists honored on the Walk of Fame, so it's great to continue his message and really keep his dream alive." He added that the star was right next to Johnny Cash's, who was his father's favorite artist. "Whenever we'd go camping, Dad would sit by the fire and sing Johnny Cash. That was his thing, so it's really special." For the rest of the interview, Robert did his father proud by talking passionately about his love for animals and introduced Jimmy to an adorable gang of baby pygmy goats, a 100-pound rodent, and more. He takes after his mom in looks. Bindy looks like dad. But Robert has in father's mannerisms and enthusiasm. Good to see. I don't really remember Bob Irwin that much, although I remember he was there in the early days. As Terri phased in to become central, the father sort of faded back. I understand that Bob and Terri had a parting of ways over her commercialization of the Australia Zoo. Even though he and Steve had founded that crocodile park and zoo together in the early days, Bob Irwin was still only a minority shareholder.. So Terri (and possibly the senior management at the zoo..) bought him out and retired him off. wolf wrote: Even though he and Steve had founded that crocodile park and zoo together in the early days, Bob Irwin was still only a minority shareholder.. The Guardian wrote: Irwin [the senior], a former plumber, moved his family to Queensland in the 1970s and started a small reptile park that grew into Australia Zoo. He and his wife, Lyn, who died in 2000, handed over the operation of the zoo to his son and daughter-in-law in 1992...He has often been praised for his "foresight and innovation" in the captive care of Australian wildlife and is said to have been his son's role model. If the park was lawfully handed over to the younger couple in 1992, the senior Irwin has no say in matters. No legal say in the operation, but he probably still had some equity remaining in the property itself.. Which would have been why it was reported in some newspapers down here at the time, that Terri Irwin had borrowed/re-financed to buy out Bob Irwin's share in the business. Bob Irwin senior is of that older "paternalistic" generation down here, where some (many..) of them are stubborn enough as still believe that their way is the only way, even after they have signed over actual control of their share of a family business to the next generation. wolf wrote: No legal say in the operation, but he probably still had some equity remaining in the property itself.. Yes, I thought about that after I wrote. He probably placed the whole thing in a trust. Anyway, I think you're right. He seems a crusty old coot.